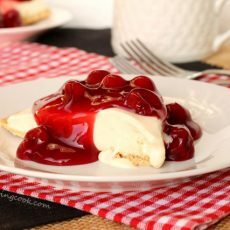 This classic cherry cheese pie is super simple to make but there’s a trick to making sure that it turns out just right. 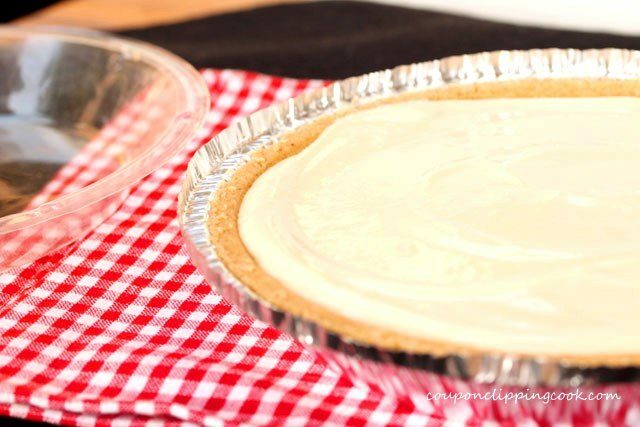 There are also some simple steps to take that are helpful when storing and serving this delicious pie. 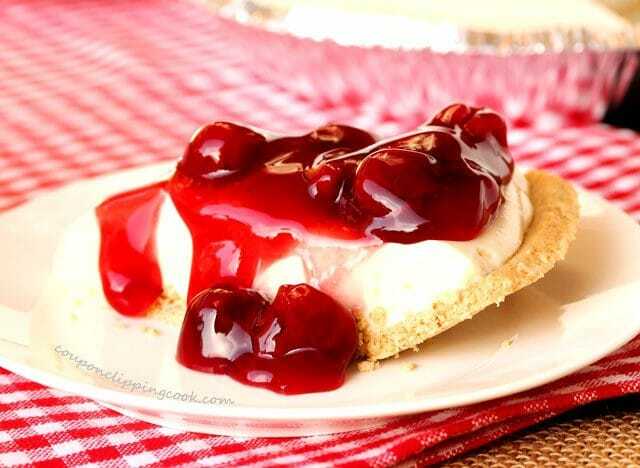 This cherry cheese pie recipe only has 6 ingredients and is such a beautiful dessert especially considering how easy it is to make. And most importantly, it tastes really good. You may have seen this recipe before, it’s been around for a long time, at least going back into the 1970’s. It’s become a tradition to make it for the Holidays in my kitchen. 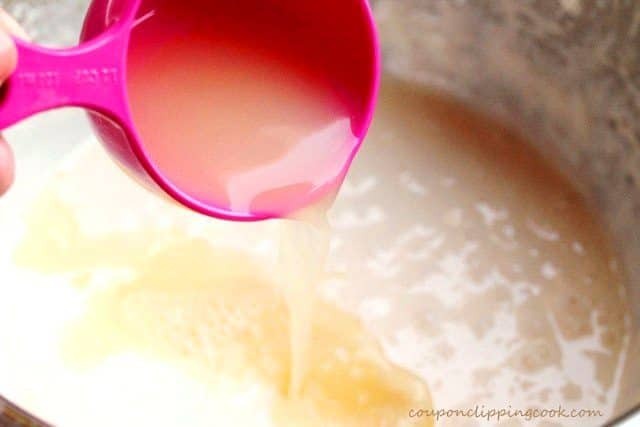 There are a couple versions of this recipe that I’ve seen the most of, where the only difference is how much lemon juice (reconstituted lemon juice from a bottle) is used. 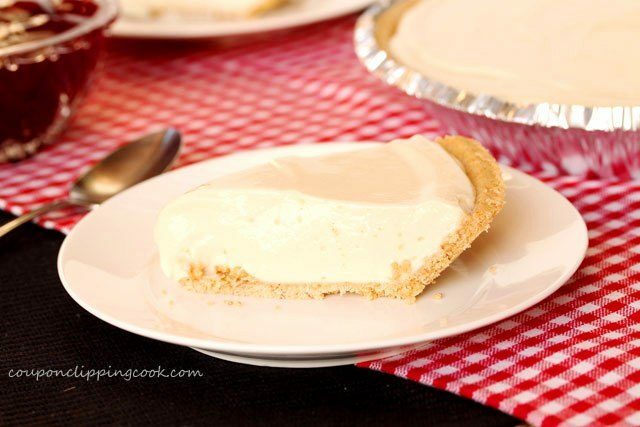 In one version 1/2 cup is used (the cheese pie filling is a little creamier and a bit more tart) and in another version 1/3 cup is used (the cheese pie filling is a little thicker and just a bit less tart). Between the 2 versions, the difference in the amount of the lemon juice used is 2 tablespoons plus 2 teaspoons (the difference between 1/2 cup and 1/3 cup). In this recipe I use an amount of lemon juice that’s just about in the middle of the 2 versions mentioned above. When I wake up early on Thanksgiving morning to get started on all of the cooking and baking, this is one of the first things I make. Although it’s a no-bake recipe, I make it early so that it has a lot of time to chill in the fridge. I mentioned above that there is a trick to making this pie so it turns out just right. 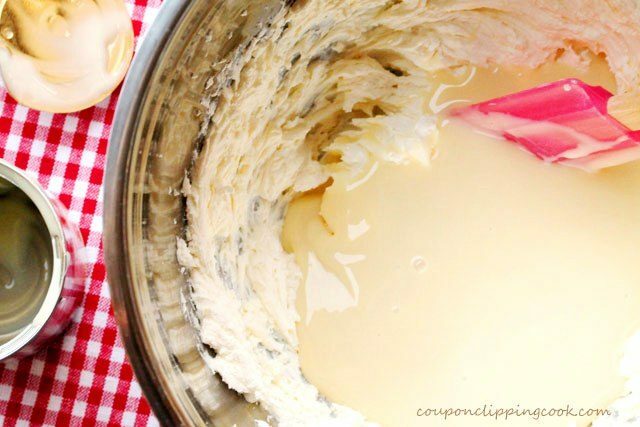 The trick is not to make a common mistake that I’ve made a number of times and that is…don’t put all of the ingredients in the mixing bowl at once. It’s really important to add the ingredients in the specific order that’s listed in the instructions. So often if I’m baking something I’ll get a little ahead of myself and just put all of the ingredients in the mixing bowl at the same time. 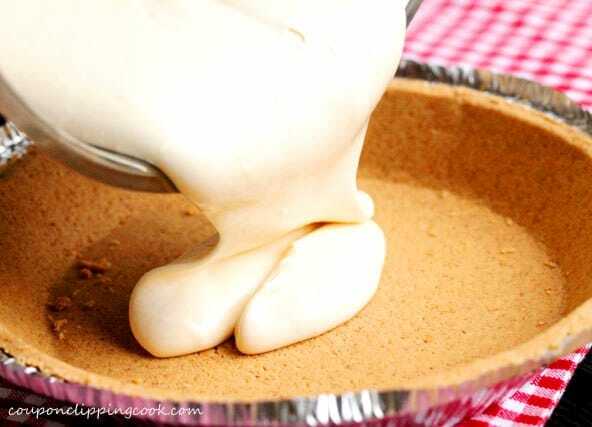 For this pie, it will ruin it if it’s made this way. 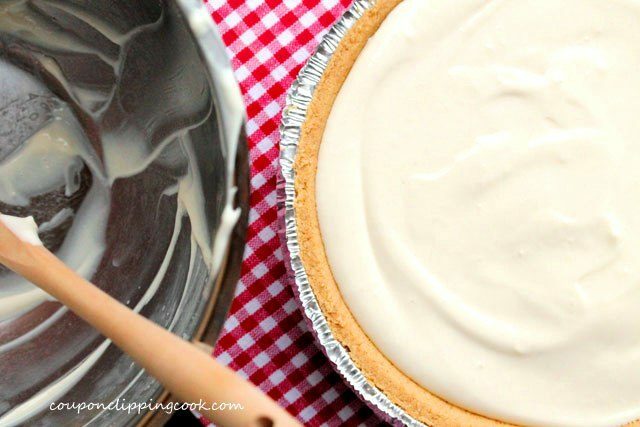 Most importantly, for this pie the lemon juice and vanilla extract must be stirred in right at the end. 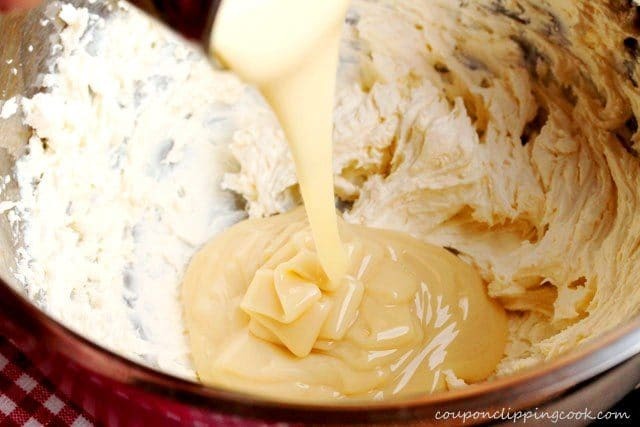 Never add those ingredients when mixing the cream cheese and condensed milk together. If the lemon juice is mixed in too soon, the pie filling will be a mushy mess. 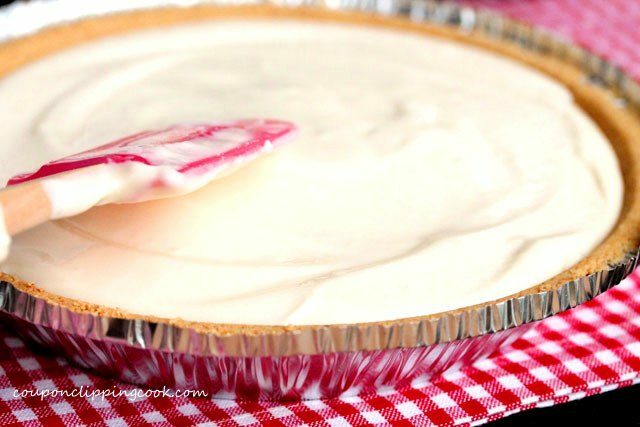 I wanted to also share with you a really helpful way to store this pie in the refrigerator. For me, on Thanksgiving and Christmas my fridge space is at a premium. My refrigerator gets ridiculously crowded with all of the ingredients and dishes that I make for the appetizers, dinner and dessert. If I so much as reach for celery, something can easily fall out of the fridge on my foot! So when it comes to this cheese pie, once it’s made the only option is to put plastic wrap over it and put it in the fridge right? What a mess that could make in a crowded fridge and there’s lots of potential for smashing the pie too. 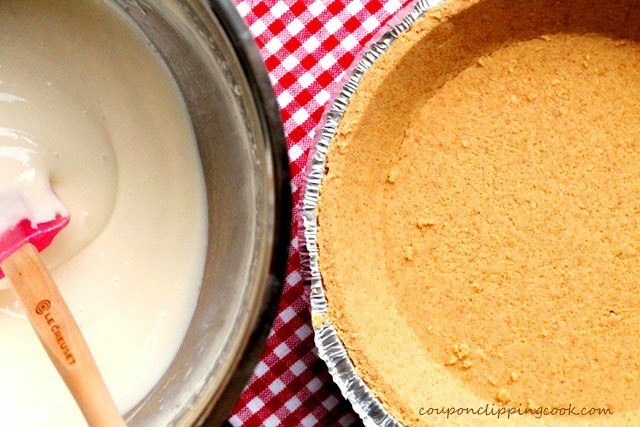 There’s a better way by using the plastic top that comes with the pre-made pie crust. 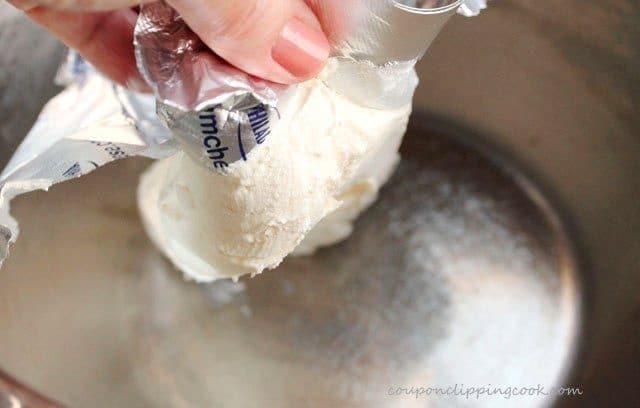 You first remove the label that’s on the plastic lid from the pie crust, wash and dry it and then turn it over in the opposite direction that the pie crust was packaged in. 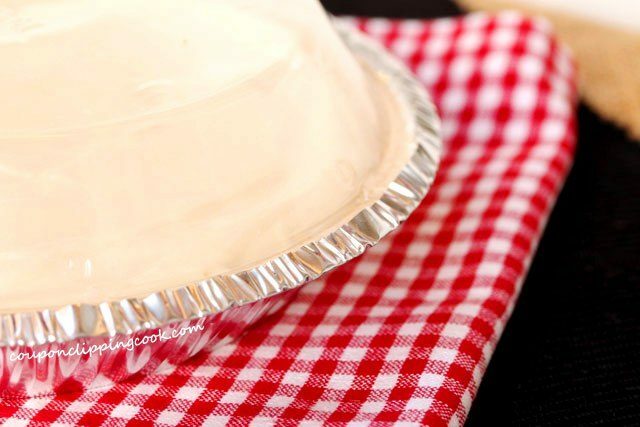 This creates a “dome” to not only protect the pie but allow light things to be set on top of it in the refrigerator. 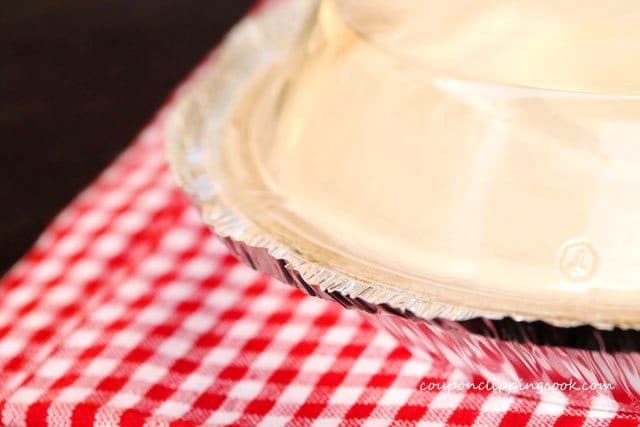 To secure the lid, the foil edges from the pie tin (that the pre-made crust is in) are lifted up so that the plastic lid can fit inside the edges. 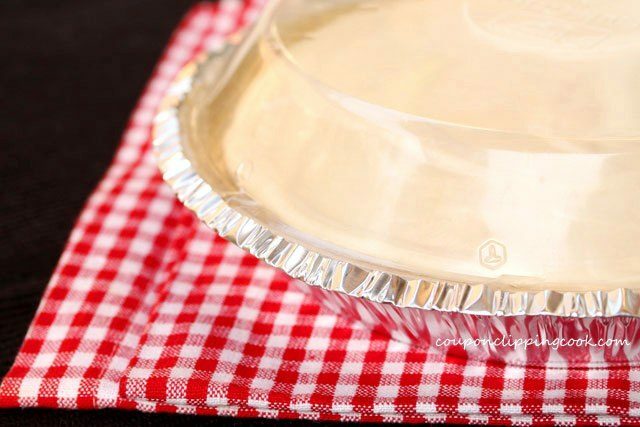 Then when storing the pie, the foil edges are pinched down over the edges of the plastic lid to secure it in place. This packaging trick really comes in handy. Another important thing to consider is that some guests may not like cherries or want them on top of the pie. So an option is to NOT put the cherries on top of the entire pie ahead of time. 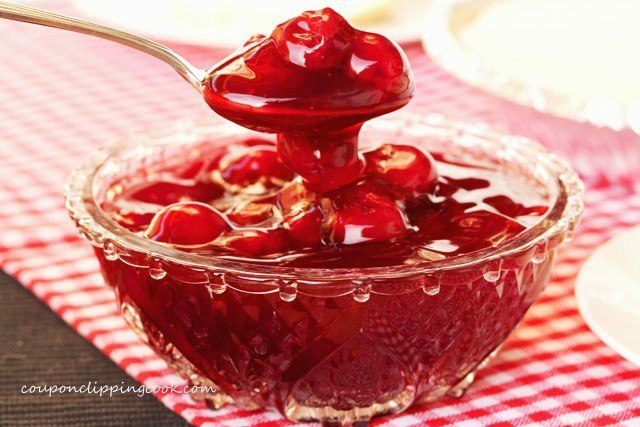 Instead, put the cherry topping in a pretty serving dish and serve it chilled on the side with a spoon for guests to help themselves. I personally like this cheese pie without the filling on top sometimes. It’s so good as is. 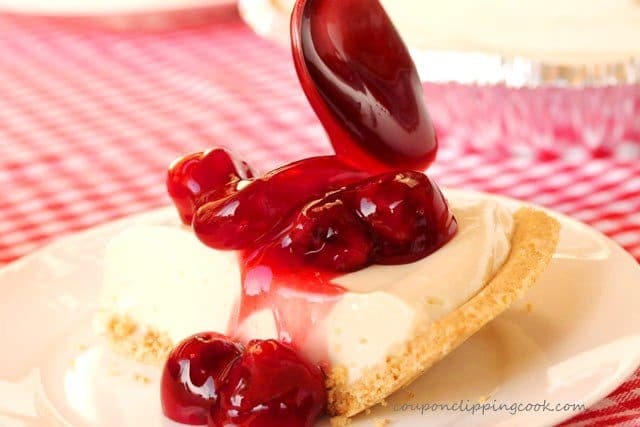 Also, spooning the cherry topping over each separate piece is such a pretty way to serve the pie because it drips down the sides and the color contrast looks so appealing. And if you really want to get creative you can serve this cheese pie with a variety of different toppings and allow your guests to choose whatever flavor they like. Right next to the cans of cherry pie filling on the shelf at the grocery store there are generally other varieties such as blueberry and apple pie filling toppings to choose from. Or fresh berries would be nice too. 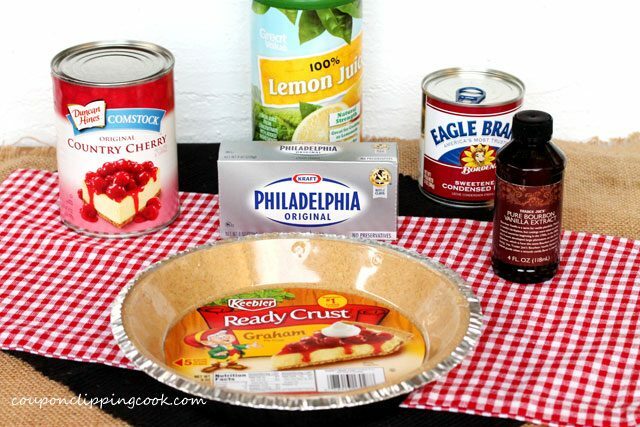 Let’s check out the ingredients and how to make this wonderful pie. Some of the images and instructions below are the same as the tips I mentioned above. 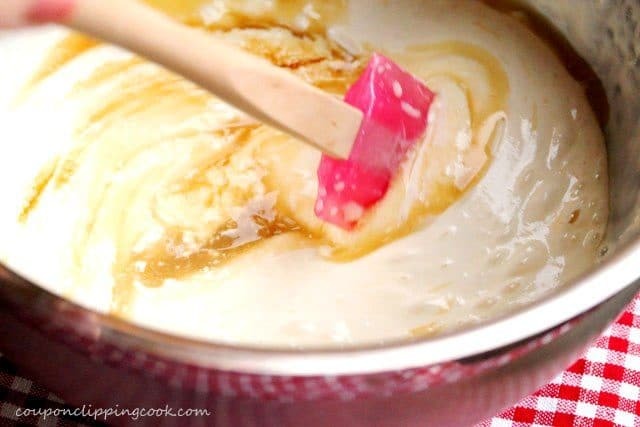 …and beat with a mixer until light and fluffy. 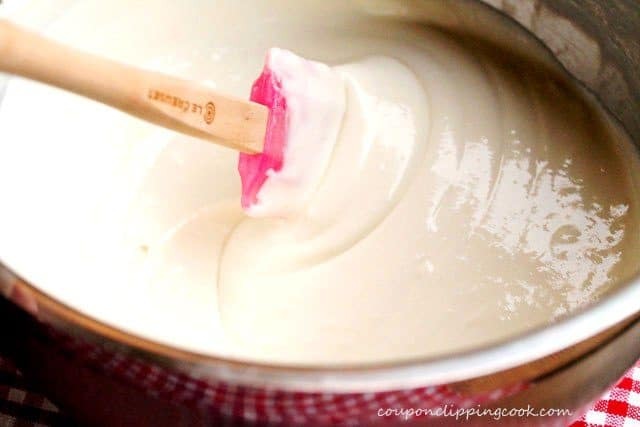 Pour the condensed milk in the bowl and beat until thoroughly blended. 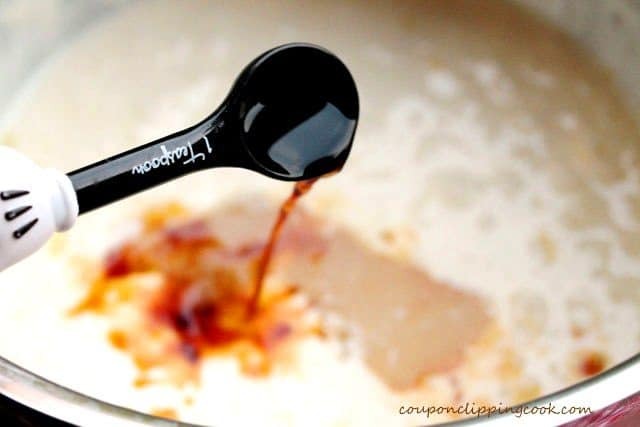 stir with a spatula or large spoon until light and creamy. 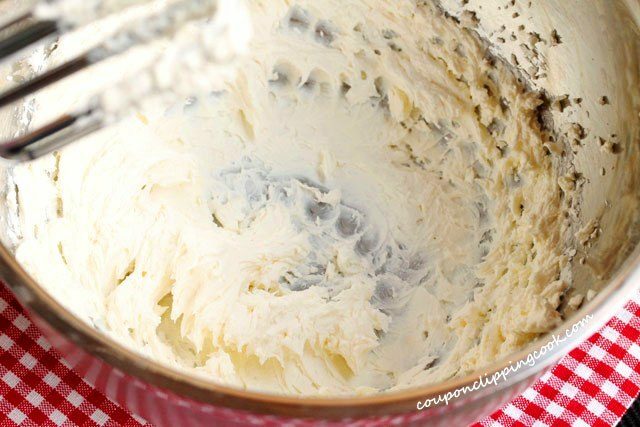 …and gently spread the cream cheese mixture evenly on the top. Peel the label off of the lid of the graham cracker crust and wash off the plastic lid. Open up the foil edges around the crust pan. Turn the lid over, opposite of the way that it was originally on the crust pan, and set it over the cheese pie. set the pie in the fridge for at least 3 hours to chill. Once chilled, and just before serving, cut each piece of the cheese pie and set them on the serving plates. top each piece with the cherry pie filling and enjoy. The colors in this cherry cheese pie are so pretty and festive. Here’s a version of this cheese pie recipe without the crust. Instead it’s served layered, in small glasses. Here’s an example called “Layered Cherry Cheese Pie in a Glass”. 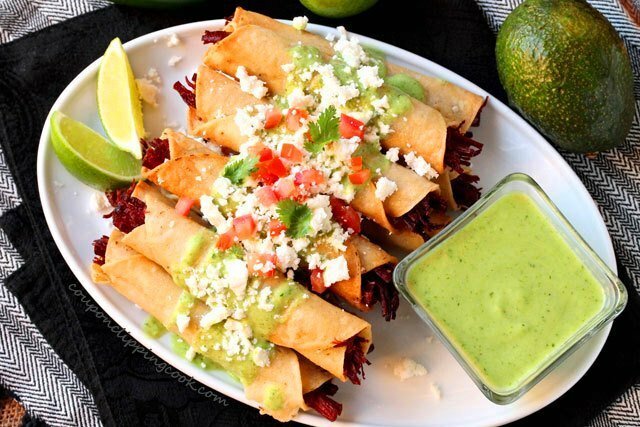 This recipe was originally posted on November 23, 2013.
nice!it seems very easy and looks delicious. Hi Lety, thank you for stopping by!